Prototype: Czech Railroad (České drahy ČD) class 754 general-purpose locomotive. Its striking looks has earned it the nickname "Diving Goggles" or "Cobra" (Brejlovec). Built starting in 1970. Model: The frame and body are constructed of die-cast metal. The locomotive has a built-in digital decoder and a sound generator for operation with DCC and Selectrix. The motor has a flywheel. 4 axles powered. Traction tires. The headlights and marker lights change over with the direction of travel. Warm white LEDs are used for the lighting. The headlights, marker lights, and cab lighting can be controlled digitally. The headlights and marker lights change over with the direction of travel in analog operation. Length over the buffers 104 mm / 4-1/8". Closed end skirting that can be replaced. 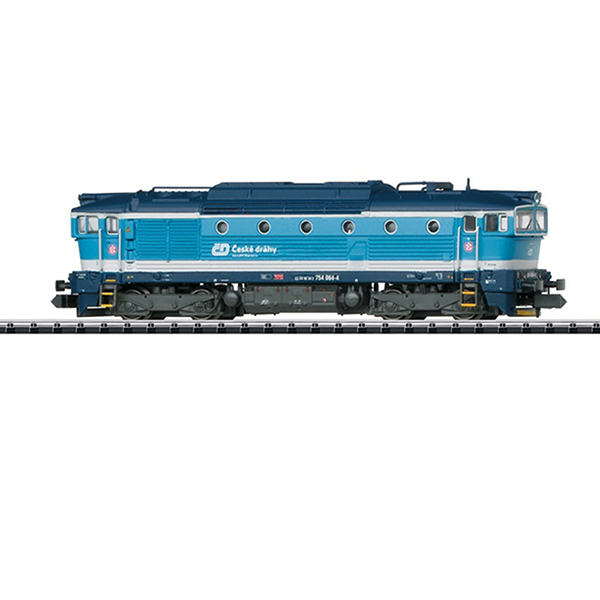 Passenger cars to go with this locomotive are available under item numbers 15935 and 15989. "Diving Goggles" – Classes 750, 753, and 754 for the ČD, ČDC, ZSCS, and ZSSK "Diving Goggles" or "Cobra" are the synonyms for the most striking diesel locomotive of former Czechoslovakia. The locomotives have nicknames thanks to the unique look with the anti-glare cabs. The Czechoslovakian locomotive builder ČKD developed the class T478.3 at the end of the Sixties in order to relieve the lack of diesel road engines for passenger service on the Czechoslovakian State Railways (ČSD). The predecessor model, the class T478.1, formed the basis. The new diesel electric unit was designed to be about 72 metric tons and had to be able to pull passenger trains at a maximum speed of up to 100 km/h / 62.5 mph. Many proven components from the class T478.1 were adopted, the complete running gear, the design for the main frame and the engine room, the hydrostatic drive for the cooling vents, and the type PG 500 steam generator. By contrast, the locomotive body with its two end cabs was given a modern look developed by industrial designers. The type "K 12 V 230 DR" diesel motor was also newly developed by ČKD. Four hundred eight production locomotives were built between 1969 and 1977 as the class T478.3 (with steam heating). Starting in 1988, they were incorporated as the class 753 into the motive power roster of the ČSD according to the new numbering scheme. After the construction of two prototypes with higher performance in 1975 another 84 units of the comprehensive class T478.4 with electric heating were delivered in 1979/1980. The ČSD took them into the new numbering scheme as the class 754. Between 1991 and 1995, 163 units of the class 753 were converted to electric heating in the new class 750 with the same assignment numbers. After the division of Czechoslovakia on January 1, 1993, around 75% of the "Diving Goggles" came to the new Czech State Railroad (ČD), while the remaining 25% was taken over by the newly established Slovakian State Railroad (ŽSR). In 2001, the ČD sold 57 locomotives of the class 753 to Inekon Holding in Prague. The "Diving Goggles" were updated there and were sold mostly to an Italian private railroad operator starting in 2003. Nine units were equipped with a used slow running ČKD six-cylinder motor, 31 locomotives were given a new Caterpillar type "3512 B DITA" motor as well as new electrical equipment from Siemens. The latter were then designated as the class 753.7. The Italian Ferrovie Nord Milano (FNM) took 18 units of this group into their motive power roster as the class DE 520. Since then other locomotives were converted in a similar manner for the Czech private railroads AWT and Unipetrol Doprava as well as the freight service group ČDC of the Czech State Railroad.